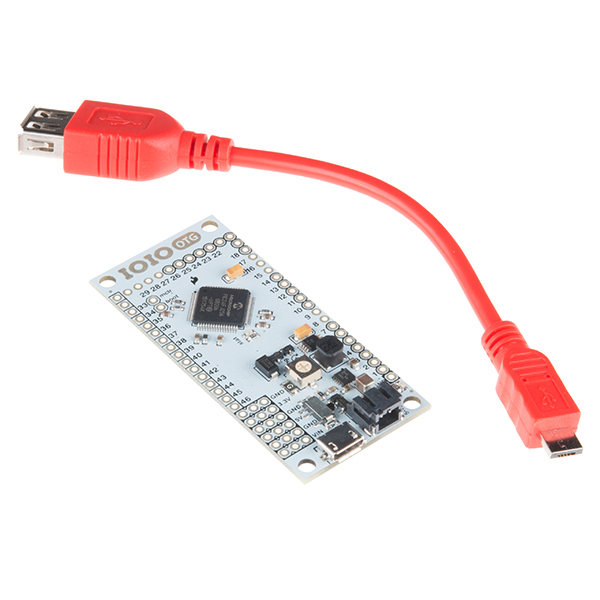 What separates the IOIO-OTG from previous IOIO boards is the ability to leverage the USB On-The-Go specification to connect as a host *or *an accessory. There are several ways to connect the IOIO to your Java app. If the app is running on your Android device, the IOIO-OTG will act as a USB host and supply charging current to your device (meaning the IOIO-OTG will need its own power source). If your app is running on a Windows, Linux or OSX machine, the IOIO-OTG will assume device mode and present itself as a virtual serial port. When in device mode, the IOIO-OTG can be powered by the host! Connecting a USB Bluetooth dongle will cause the IOIO-OTG to show up as a Bluetooth serial connection so you can go wireless! 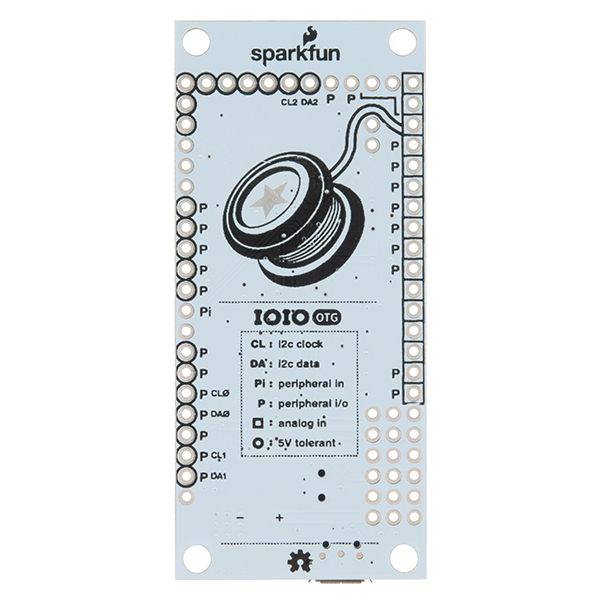 A switch on the board can be used to force the IOIO-OTG into host mode, but most of the time the board can be left in 'auto' mode and it will detect its role in the connection. 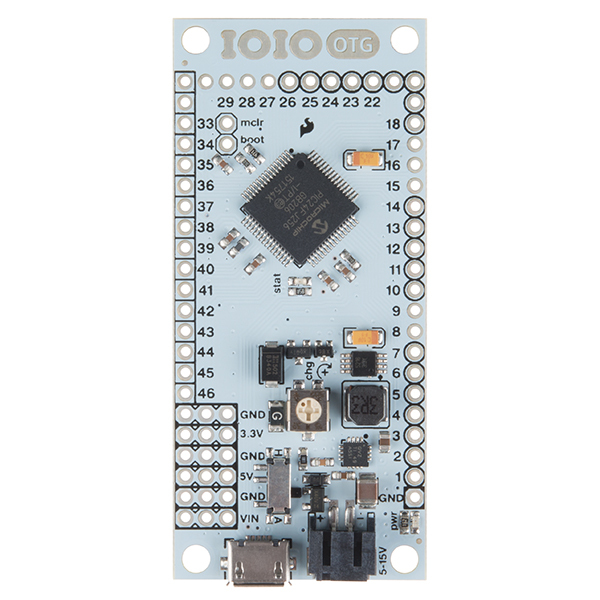 We're now shipping the IOIO-OTG board loaded with the V4.02 bootloader and the V5.06 application firmware. New application firmware is frequently released, and can be upgraded without needing a programmer using the IOIODude application. Additionally, this version of the IOIO-OTG has corrected the IC power failure issue due to the on-board switch voltage regulator failing as well as adding a missing decoupling cap on the AVIN pin. 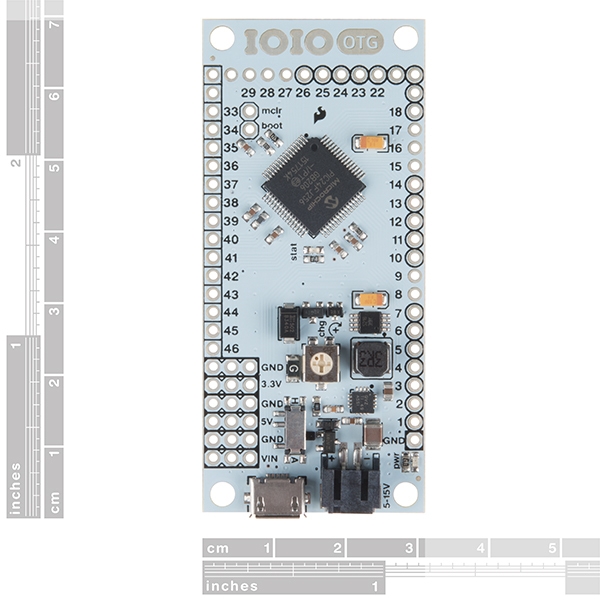 This new IOIO-OTG has fixed the problems that plagued the previous version making it a true vision of how the board is intended! You can find out more about these updates here. Note: This product is a collaboration with Ytai Ben-Tsvi. A portion of each sales goes back to them for product support and continued development. Get started using the IOIO-OTG with your Android device or PC. What kind of battery connector does this module requires? I have a project in mind that I think this board may work for. I would like to connect a USB dongle that talks to a medical device to the board with the USB otg function, then connect a Bluetooth module (hm-11 or similar) to the board so it can send the data from the USB dongle over Bluetooth to an Android phone. Do you think this is achievable with this board? I use them to drive multi-card HF RFiD detection logic from Android tablets. I was expanding an array built a few years ago. Just dropped the new ones in. Same wire config, new power distribution, and all is good.